As you may have noticed, I’ve been trying hard to rotate between baked goods and healthy meals. Quite a task for me some days as all I want to do is bake you all the things. 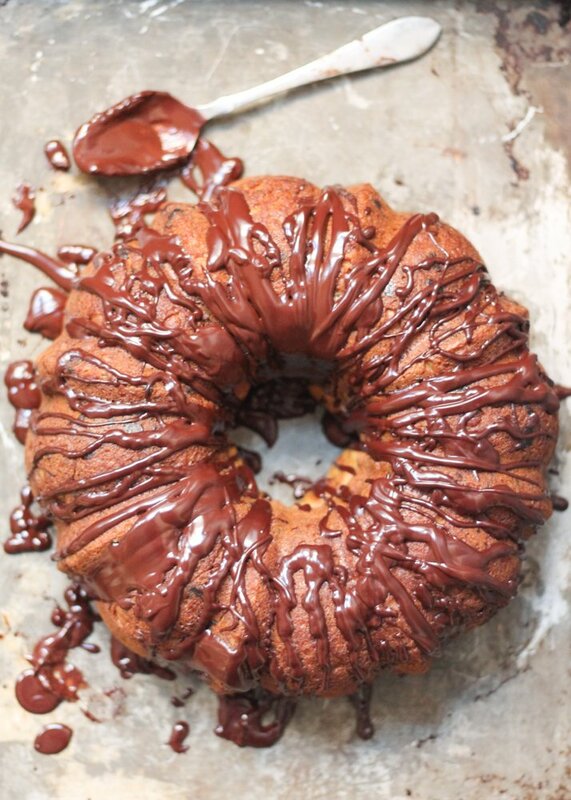 Lately I’ve been craving a good bundt. Because I like big bundts. And I cannot lie. Okay, I’ll stop myself there. 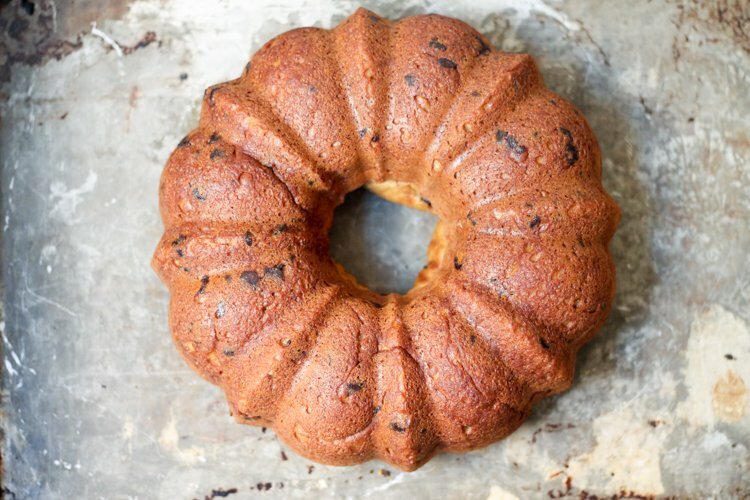 Truth be told there isn’t anything better than showing up on someone’s doorstep with a big old bundt cake. All pretty looking because it’s made in a fancy pan and drizzled in a chocolate glaze. 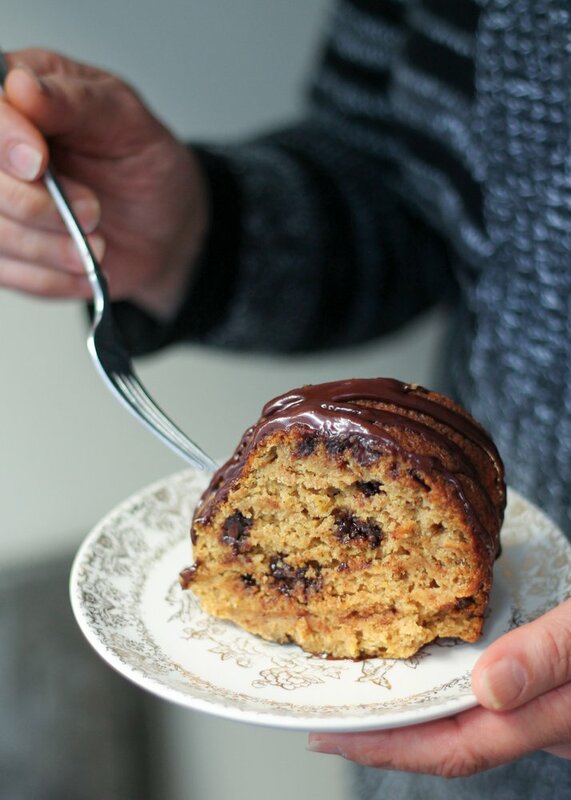 If you’ve never made a bundt cake before then you’re in for a real treat. Don’t have a bundt pan? Here is one of my favorites. Brown Butter: Always a must when it comes to giving baked goods flavor. If you’ve made these cookies then you know it to be true. Check out my tutorial on how to brown butter if you need help. Don’t worry dairy free friends, you can also sub coconut or olive oil in place of the butter. Greek Yogurt: I love using greek yogurt in recipes because of how much moisture it adds. Not to mention a decent amount of protein too! Looking for other options? Try out a coconut or almond based dairy free yogurt. Honey: The great thing about sweetening baked goods with honey, is that you don’t need to use as much compared to if you were using just sugar. Honey is naturally sweeter and full of minerals. Other options to use include pure maple syrup, coconut nectar or agave nectar. Dark Chocolate: Here’s where you can be a little more creative in the recipe. There plenty of artisan chocolate bars out there so I suggest finding one you really like. 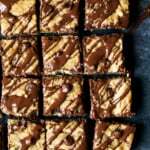 You can also mix up the chocolate chips and use chocolate chunks, peanut butter chips, butterscotch chips, or anything you can dream up. I really love this dark chocolate. 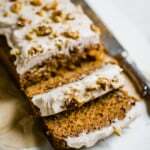 This recipe is lovely, slightly sweet and best served the day after baking it (if you can wait that long). It’s best to wrap the cake in plastic wrap, before glazing of course, and then let it still at room temperature for 24 hours. The natural sugars from the bananas will release, the cake will become more moist and the flavor is a thousand times better. HELLOOO SATURDAY BRUNCH! 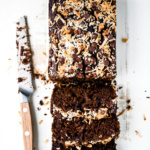 You can serve this cake a few ways. 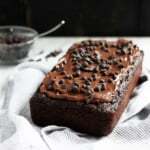 Either as a banana bread brunch treat without the glaze or drench it with dark chocolate and serve it as a cake. Please note that the nutrition below does not include the glaze but does include the chocolate chips. If you make this recipe or anything else from Ambitious Kitchen, be sure to tag #ambitiouskitchen on Instagram so I can see your creations! To keep up to date with posts and behind the scenes info on Ambitious Kitchen, follow me on BlogLovin’, Facebook, Twitter, Instagram and Pinterest. xo! 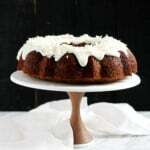 A lightened up banana bundt cake made with whole wheat flour, a touch of brown butter, honey and dark chocolate. Preheat oven to 350 degrees F. Generously spray 12 cup bundt pan with nonstick cooking spray. In a large bowl, whisk together flour, baking soda, cinnamon and salt; set aside. Place butter in a medium saucepan over medium high heat. After a couple of minutes the butter will begin to crackle and foam—make sure you whisk consistently during this process! Another minute or two, and you will notice the butter turning a slight brown (caramel) color on the bottom of the saucepan; continue to whisk and remove from heat as soon as the butter begins to give off a nutty aroma. Immediately transfer the butter to a bowl to prevent it from burning. Set aside to cool for 5 minutes. Add brown butter, bananas, honey, vanilla, eggs, milk and yogurt to a blender. Blend on high for 1 minute or until well combined, smooth and creamy. Add wet ingredients to dry ingredients and mix until just combined. Gently fold in chocolate chips. Divide batter evenly into bundt pan and bake for 45-60 minutes or until a knife inserted into the middle of the cake comes out clean. Transfer to wire rack for 10-15 minutes, then invert cake onto rack and allow to cool completely. Cake is best the next day. Wrap tightly with plastic wrap and store at room temperature. 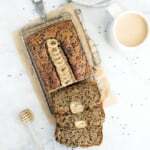 Banana cake/bread is always best the next day. Once ready to eat make the dark chocolate glaze, if desired. Place a small saucepan over low heat; add the dark chocolate and almond milk. Stir frequently until all of the chocolate is melted. Drizzle the glaze over the top of the cake. Cake serves 16. To make dairy free: You can use coconut or olive oil in place of the butter, coconut yogurt in place of the greek yogurt and dairy free chocolate chips such as the Enjoy Life brand. Nutrition information includes everything except the glaze. Instead of greek yogurt, you may use regular plain or vanilla yogurt. You can use maple syrup or agave nectar in place of honey. 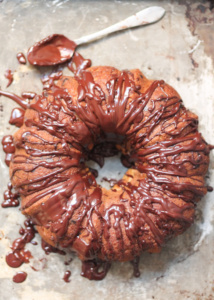 15 Responses to "Whole Wheat Brown Butter Banana Bundt Cake with Dark Chocolate"
Beautiful Big Banana Brunch Bundt!!! 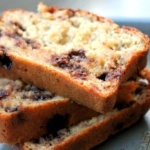 Question…could one possibly sub in walnuts for the chocolate chips and obtain your perfection results? This is right up my alley! Healthified but still all sorts of decadent with that brown butter and chocolate. YUM. Also I totally get Sir Mix-a-Lot in my head every time I use my bundt pan. It’s just a given. Do u think this may work well subbing half the whole wheat flour with oat flour? Bundt cake perfection!!! This looks scrumptious! Your baking skills are incredible! 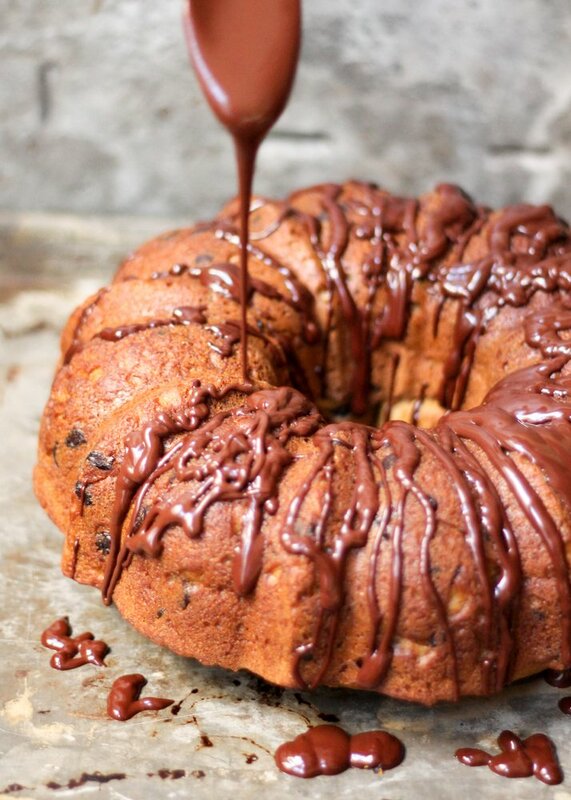 This banana bundt cake looks divine.. and all that chocolate is seriously making me drool. Can I make this as a regular cake? How would the oven temp and baking time change? If I can’t find dairy free yogurt then how do I sub for the yogurt? Applesauce? More almond milk? Thanks!